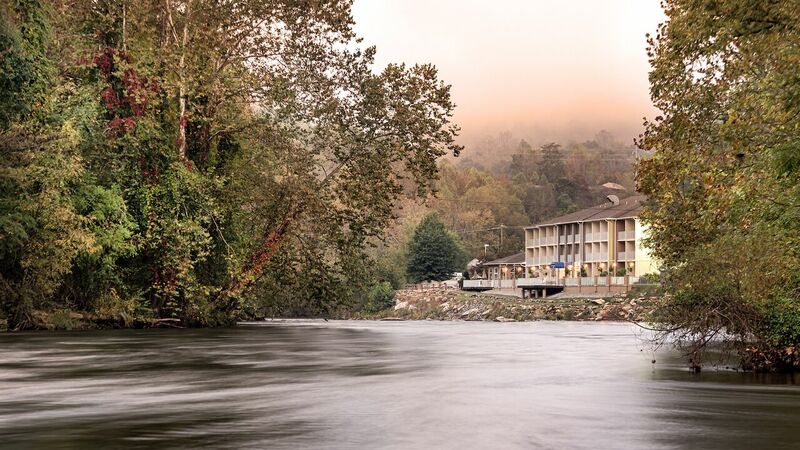 For a wedding in any season of the year, the Best Western River Escape Inn & Suites offers a gorgeous space that displays all that the beautiful Great Smoky Mountains has to offer! Our beautiful 650 square-foot event room is the perfect place for off-site meetings, training sessions, receptions, or any type of social gathering. The spacious Tuckasegee Room seats forty comfortably theater style, and has the option of expanding out into the breakfast area, as well as our riverside patio, accommodating almost any size event. We also have a barbeque pit for outside grilling events. The day before the event the room will be set up according to your specifications. We supply a podium, table cloths, and skirts. We also allow outside catering for any event on-site, and have a list of caterers available for your convenience. Here at the BEST WESTERN PLUS River Escape Inn & Suites we spend a great amount of time catering to the needs of our special events guests. We do offer special group rates for out-of-town guests and extend a great environment for wedding receptions and rehearsal dinners. We have three beautiful spaces to offer you, and have a specialized team that will assist in the set up of these options, and greet your group upon arrival. Please feel free to come and take a tour of the hotel to see how you can utilize our facility to best suit your needs.